Starting as a one-county pilot program in 1996, Pennsylvania's Statewide Adoption and Permanency Network (SWAN) Legal Services Initiative has expanded to each of the state's 67 counties. It was developed by Family Design Resources Inc., in its capacity as program administrator for SWAN. Aimed at expediting permanency for children, the Legal Services Initiative helped Pennsylvania achieve a No. 1 ranking, according to a 2014 report, in timeliness of adoption among the states. 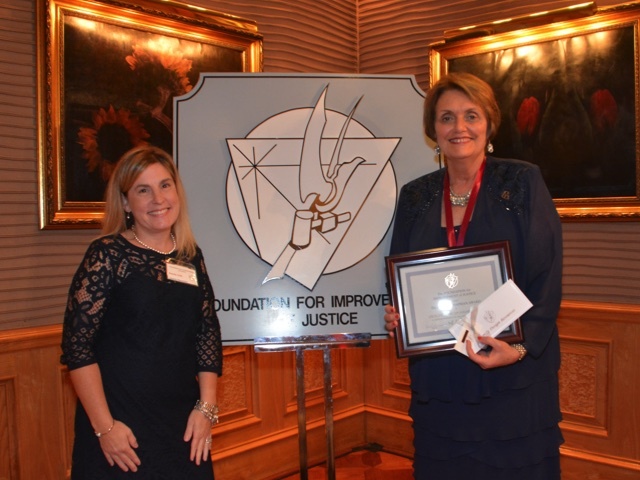 That success has garnered FDR one of only six 2016 Paul H. Chapman Awards from the Foundation for Improvement of Justice. The winners accepted their prizes -- a certificate of appreciation, commendation bar pin, medal and check for $10,000 -- at a Sept. 24 banquet in Atlanta. The Georgia-based Foundation for Improvement of Justice, a private nonprofit founded in 1984, seeks to improve local, state and federal justice systems. The Chapman awards recognize individuals or organizations whose innovative programs have led to improvements in those justice systems. Sandra Gallagher, who serves on FDR's board of directors, nominated the organization for the Chapman award. The materials she submitted with the nomination noted that the Legal Services Initiative is "collaborative in nature" and includes embedding paralegals in county children and youth agencies. "Program evaluation has shown that the addition of paralegals has significantly increased the court's efficiency in finalizing adoptions by enabling caseworks to shift their focus from legal preparation to further assisting children and their families," according to the submission. FDR is marketing the program and training components of the Legal Services Initiative to other states under the umbrella name Legal Partnership for Permanency. Photo: Accepting their organization's Chapman Award are, from left, FDR's Natalie Witt-Washine, SWAN Legal Services Initiative division manager, and Brenda Lawrence, executive director.